Dating back to the 16th century, the psychomanteum was a tool used for channeling spirits from the beyond or other realms of being; a room in which the focal point is a mirror, reflecting only darkness. In modern times, in which filmed storytelling is one of our most pervasive methods of expression, we sit in our houses and gaze into black mirrors; our televisions. 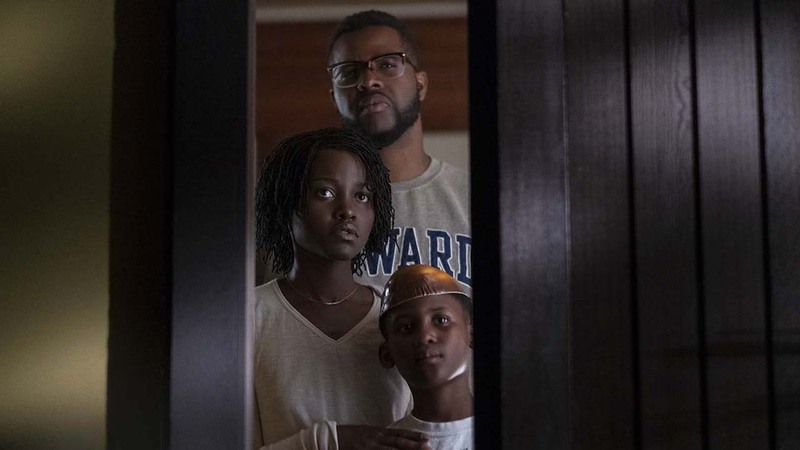 It is with a television that Jordan Peele begins his sophomore feature following the colossal success of Get Out. The idea of the psychomanteum must be known to Peele; who with great wit and craft is using film as a medium to reflect our darker halves, conjuring them out of the shadows. Us is the story of Adelaide Wilson (Lupita Nyong’o). Her and her family are on a getaway to the beaches and leafy suburbs of Santa Cruz. But visiting the area is a big step for Addie; she was traumatised there as a child when, one stormy night, she encountered a double of herself in a fairground hall of mirrors. In a first hour that matches the expertise at disquiet achieved in Get Out, Peele channels Addie’s paranoia, giving us harbingers of some unknown doom threatening to step out of the darkness. Doubles appear everywhere, be it a spider scuttling across a table in the shadow of its own effigy, to a pair of teenage twins playing on the beach. Addie finds herself in a world of echoes and perceived coincidences; all a prelude to something awful. Where Get Out focused on the experience of the individual at sea in a duplicitous environment, Us is – as its title suggests – more about the family unit, the collective, and even society en masse. Addie has a good bunch. Her husband Gabe (Winston Duke) is a lovable oaf whose clowning belies a heartfelt supportive attitude. Daughter Zora (Shahadi Wright Joseph) appears aloof (glued to her phone like any modern teenager) but has the resource to protect and defend when called for. Youngest Jason (Evan Alex) likes magic tricks and hiding; he may have an introvert’s streak but he is also pretty perceptive. Clearly the family are affluent enough to afford a nice trip away together. They tick many of the boxes that western society encourages us to aspire to. Four door car with a stick figure family pasted on the back window. Enough cash to afford a summer home. The old atomic 2.4 lifestyle; an American ideal. Us, however, holds up a dark mirror to this serenity. The family are attacked by their seemingly inhumane dopplegangers; merciless, menacing and even murderous strangers whose motives appear elusive. It channels the deep-seated paranoia engrained in those who have found themselves in sight of contentment. That fear is that the other shoe could drop at any moment; that you’re not prepared to lose what you’ve grown accustomed to. The film is at its most ferocious when it puts the audience in the same boat as the family; worrying what might possibly befall them next. And it piles on the disasters, stacking them up to cut between. Peele may have come up in comedy (and boy it shows; Us is inappropriately hysterical), but it is clear now that his love for horror runs deep. There are affectionate nods to classics throughout Us (the setting is pure Friday the 13th while Jason’s Jaws t-shirt is a nice precursor to a set piece on the water), but Peele is not beholden to his forbearers. If he can keep up the pace then he may well earn a reputation akin to John Carpenter during his hot streak, but Us shows he is his own man, with a seemingly boundless imagination. And, two movies in, certain tendencies are starting to reveal themselves. Just as The Sixth Sense and Unbreakable showed us how M Night Shyamalan loves a last-minute twist, Us doubles down on Get Out‘s fondness for basement experiments and science gone awry (remember those rabbits from the titles, people). Peele also – somewhat refreshingly for the genre, to be honest – seems tickled by the notion of exceedingly capable protagonists. Remember how Chris whaled on that guy in Get Out? There’s more where that came from. The violence in Us is hard and bloody. Indeed, the movie becomes something of a primal scream in the face of domesticity. It’s a weird one, that’s for sure, and Peele’s explanations may prove thin or half-baked for some. Regardless, the film is anchored by its leads, who do phenomenal work, kids and adults alike. Out there in front – no surprises – is Lupita Nyong’o, whose multi-faceted performance(s) here ought to put her in contention for every award going next season, unless she suffers some Toni Collette-level snubs. After the success of 12 Years A Slave it seemed as though Hollywood was having trouble placing her, and she ended up voicing CG characters and the like for a while (hello Star Wars). Just lately, however, she seems to have found her momentum again and she has all the resources in her to be one of the best leading women of her time. Peele has strengthened his game, too. In the long run, Us may not quite capture the zeitgeist-heisting highs achieved by Get Out (which seemed fated to become a defining film of its time), but its a more muscular directorial effort. Aesthetically, Peele is becoming emboldened. One particular moment caught me; a shot which directly references the ending of John Ford’s The Searchers. In that film, John Wayne’s character exits a building, framed in a doorway; a racist man for whom time has run out. In Us a black woman enters a doorway; her time has arrived. Peele’s time has arrived. He’s here. We’re all very fortunate to be here for it. Now get Googling Jeremiah 11:11.